Manhattan Chase, not to be confused with Chase Manhattan Bank, is the tale of Jason Reed (Avedon), a man who just got out of prison after six years. He’s intent on re-forming his bond with his young son Tommy (Robin Berry), a terminally depressed tot with serious back posture issues. While on the road to fixing up his life, he runs into a woman named Jennifer (Zanzarella) who is on the run from armed thugs and killers because they think she has a cache of missing drugs. So, naturally, the next step is for the three of them to move into an apartment with Jason’s buddy Victor (Roberto Gutierrez). Meanwhile, Tommy’s mom is still in the picture, and her sister Nancy (Rothrock) is a tough NYC cop. Will Jason reunite the family? Will the baddies stop their harassment of our heroes? Find out today? In the canon of Godfrey Ho’s shot-in-America phase of his career, we have Honor and Glory and Undefeatable (both 1993), but, based on the presence of Loren Avedon here, perhaps this one should have been called “Unlikable”. If we could single out one major flaw in Manhattan Chase, it’s Avedon. His smug smarminess is smeared all over the screen from the first second we see him. And the constant, annoying smirk he keeps on his face would put him right at home in the late-night Comedy Central lineup. We should also add that this movie is highly interactive. Every time he speaks, the overwhelming urge to shout “SHUT UP!” is just too strong to suppress. The fact that he somewhat resembles Jeff Speakman, but also rocks the denim-shirt-and-denim-jeans look of Jay Leno, perhaps makes him the first Jay Speakman in history. Or maybe Jeff Leno. But as demonstrated in Collision Course (1989), Jay Leno is a better action star than Avedon. Or, to look at it another way, the movie needed more Rothrock. Her scenes, as usual, are gold. She’s attractive, likable, charming, and a great Martial Artist. What more could you ask for in an actress? She should have been the main star. Even the kid who played Tommy, who never appeared in anything else, wipes the screen with Avedon. What’s this guy’s problem? Why does he have such a terrible attitude? You’re working with Godfrey Ho, dude! You’re living the dream! Stop acting like such a D-bag and, much like Tommy’s spine, you should really straighten up. Tommy gets a bunch of quotable lines throughout the movie, and while Zanzarella did a fine job as Jennifer, Gina Carano would have been great for that role. Of course, because it’s set in New York, the characters hang out near the Statue of Liberty, like all true New Yorkers do. But, lest we forget, this is a Godfrey Ho movie, after all. There’s all the funny, sped-up motion, silly reactions, disjointed plot elements, and styles of acting you see nowhere else in cinema. And because it’s Ho in NYC, the time-honored Final Field Fight takes place in Central Park. His take on the NYC locations is indeed unique, and because the movie was shot in 1998, we see movie marquees advertising Bulworth (1998) and Dr. Dolittle (1998). Strangely, and awesomely, as a sort of reconciliation present after his time in jail, Jason gives Tommy a Game Boy. An old-school one from the 80’s. In 1998. While most kids his age at that time were playing their PlayStation 1’s, Tommy had to make do. It’s a tough life. 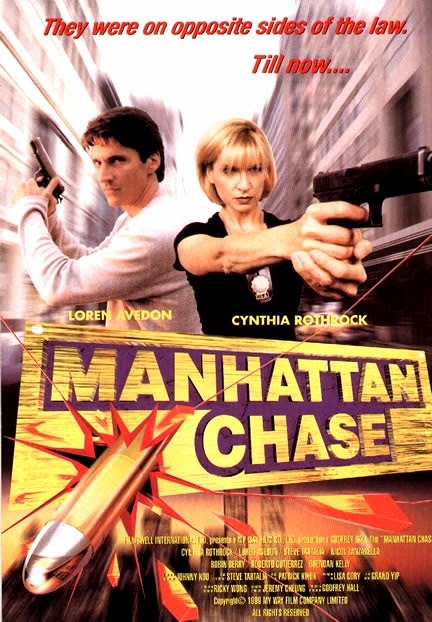 Manhattan Chase never got a U.S. VHS release, as it was clear by that time the golden age of the action movie, the video store, and the whole DTV era was over. It was a very interesting, transitional time. Maybe it’s all the fault of the unnamed theme song that plays throughout the movie, a tune with a hip-hop beat , and the only lyrics are “1, 2, 3, 4”, “Yeah!” and “Break it Up” - all said, inexplicably, in a duck voice. A DUCK VOICE. The end well and truly was nigh for DTV. This actually had an Australian DVD release (which I have). Not too bad a film. Happy you enjoyed it. We liked Rothrock but not Avedon. Haha. I liked it. It has lots of action, and I have no problem with Avedon. The best Godfrey Ho movie I've seen. If you like Godfrey Ho, definitely check out Honor and Glory or Clash Of The Ninjas. Both are a blast. I haven't seen Clash Of The Ninjas yet. I've read that the ninjas used in the Final Field Fights were actually local acrobats, not martial artists. The movies Ho cut-and-pasted were not always Chinese movies either, but parts of movies filmed all around Asia. Didn't know about the acrobats! Thanks for the Godfrey info. Definitely disagree on Avedon, he didn't come across as "smug" or a d-bag to me at all(though I did hear he has a strong dislike for Lorenzo Lamas for whatever reason)I thought his performance in this film was pretty good, and I don't think DTV era was over quite yet, while PM sadly died around the time this film came out, there was still Nu-Image to pick up the slack. BTW, how did you see this film? I noticed it's available on Youtube, it also got a german DVD release alongside the Olivier Gruner film SWAT: Warhead One. We watched the film on Youtube. Haha.